72nd Avenue west of Indiana Street (Colorado Highway 72) is closed for road reconstruction after full bridge replacement. Access to adjacent parcels is maintained. A signed detour route utilizing 80th/82nd Avenue and Quaker Street is provided. Although the weather has delayed the opening of 72nd Avenue until April, crews continue to work on other project components in order to meet the expected project completion in May. 72nd Avenue east of Indiana Street is in a temporary traffic alignment along the south side of the road. Expect narrow travel lanes. 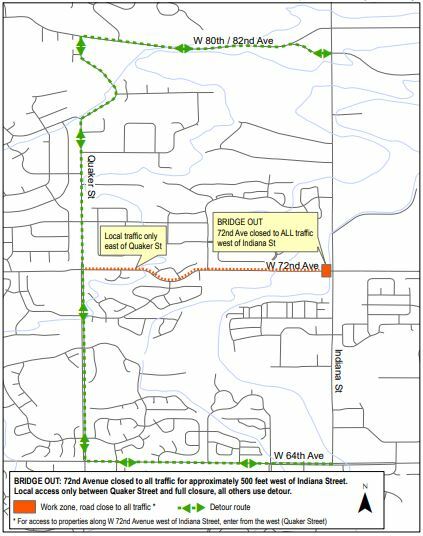 Expect single-lane, alternating traffic utilizing flaggers (Monday - Saturday, 8:30 a.m. to 3:30 p.m.) on Indiana Street and 72nd Avenue. All businesses are open during construction. The City of Arvada and contractor partner, Jalisco International, are beginning a year-long project to widen the intersection of Indiana Street (Colorado Highway 72) and 72nd Avenue. Intermittent lane closures with alternating traffic from 8:30 a.m. to 3:30 p.m., Monday through Friday. One lane in each direction will be provided whenever possible during working hours and when work is not taking place. Occasional night and weekend work is expected. Speed limit reductions are anticipated and fines are double within work zone. The project is weather-dependent and the schedule is subject to change. Project completion is expected in summer 2019. 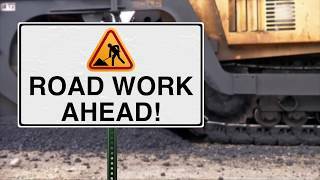 Project hotline: 720-900-8670; project email: indiana72nd@workzone.info. To be added to the project notification list for future project updates, send a request to the indiana72nd@workzone.info.